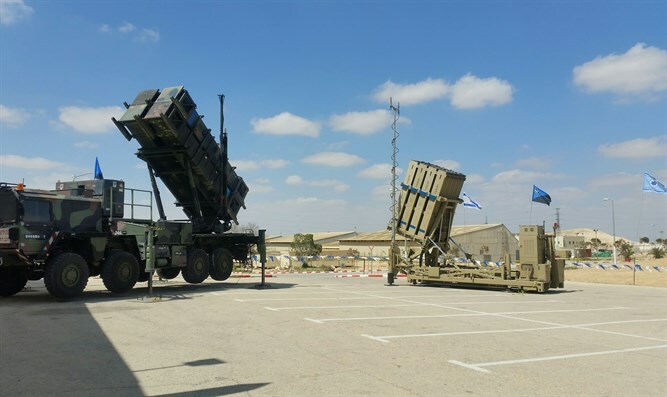 The Israel Air Force held an official ceremony Sunday afternoon to mark the 'David's Sling' (formerly known as 'Magic Wand') air missile defense system becoming operational. The 'David's Sling' system is designed to intercept medium range missiles and was developed jointly by US and Israeli defense industries. It will operate alongside the Iron Dome short range missile defense system and the Arrow 2 and Arrow 3 long range missile defense systems. Prime Minister Binyamin Netanyahu, Defense Minister Avigdor Lieberman, IDF Chief of Staff Gadi Eizenkot, Air Force Commander Maj. Gen. Amir Eshel, US Missile Defense Agency Director Vice Admiral James Syring and Israeli Air Defense Commander Brig.-Gen. Zvi Haimovitz attended the ceremony. Prime Minister Netanyahu said at the ceremony: "Today marks an important milestone in our joint development of cutting-edge missile defense technologies. We both face increasingly sophisticated threats, but we have repeatedly demonstrated that we can meet these challenges together a lot better than any one of us could alone." "At a time when budgets are tight, please know that the government of Israel and the people of Israel are deeply grateful for the ongoing support by the United States of this crucial effort and the ongoing support of the United States for the general defense of Israel. "We have pioneering technology here and Israel continues to lead the world in this field. The ingenuity of our people and the fighting spirit of our soldiers multiply our strength against our enemies and enable us not only to defend the home front but to achieve victory in battle. I ascribe very great importance to our ability to defend the home front. We have proven this in the allocation of resources and in producing interceptors and other means. "As an ancient people that treasures life, we continue to march in the path of King David. David's sword in our hand, David's Sling is in our skies and David's shield is on our flag. We will join strength to spirit and we will ensure Israel's victory."